July was a month where it felt like I spent the whole time being away, or preparing to go away, so I feel as though I was super busy without actually doing much! 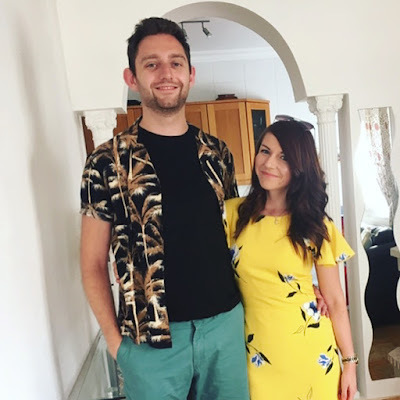 We started the month in Centre Parcs (which I talked about last month), spent 8 days in Spain, and then two days after I got back from Spain I was down in London for 4 days, so it feels like I haven't actually been home much at all! This month, 5 months earlier than billed, I hit my Goodreads reading goal for the year! I set my goal as 4o books even though I know over the last couple of years I've been reading about twice as voraciously! I didn't want to make reading a chore, and give myself some big lofty goal which would make me pick up novellas instead of big, lofty books I really wanted to read. I'm really proud of achieving my goal already, and I'm currently up to 51 books. I reckon I'll read somewhere between 70 and 80 books this year. 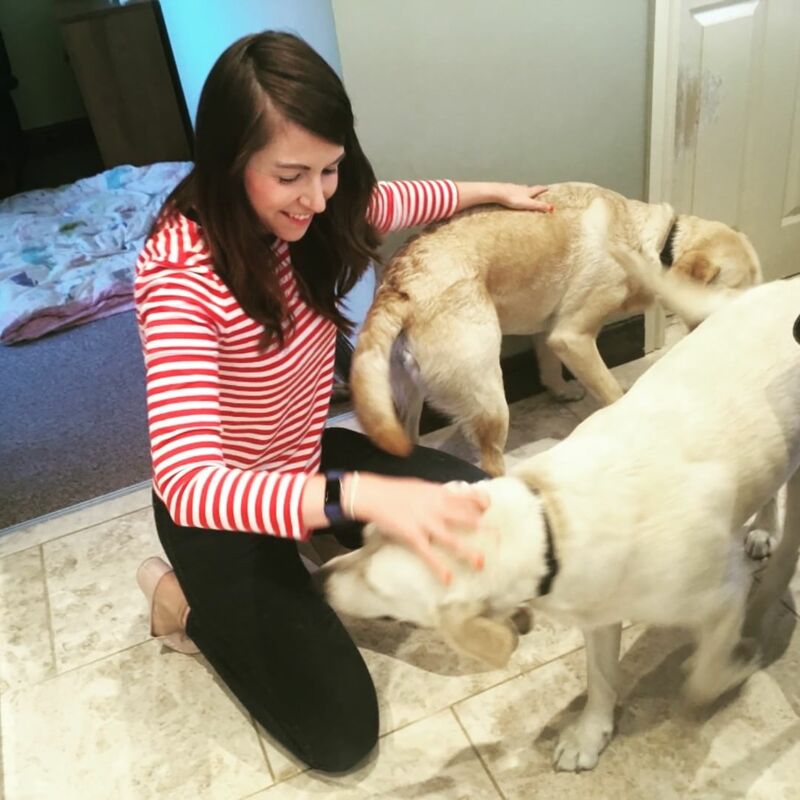 I hung out with some doggies. We've started to tentatively think about redoing our living room. We had it redecorated a few months ago but we've not really been in a rush to buy new furniture (I nearly said "to get it finished" but I don't think a room in a house is ever "finished"!). 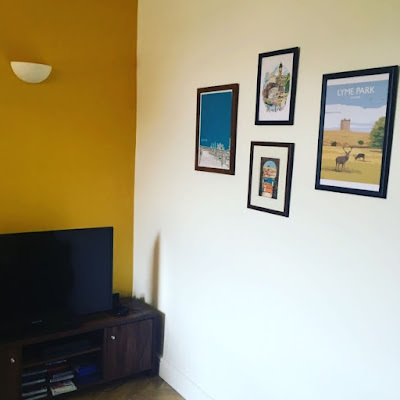 We've got a few ideas of what we want, after a few trips to Next and IKEA and Dunelm, and we've made a start putting pictures back up after we took them all down after we decorated, and we got a lovely floating shelf from IKEA which I'm totally in love with. We're taking it very one-step-at-a-time so we don't rush into any decisions but I'm excited for make progress. For my Birthday last year I got a little set for growing your own herbs on the window ledge and a few months ago I finally got it all set up. I'm not green fingered by any stretch of the imagination (RIP the tomatoes I tried to grow), but I love my little herb garden and I was really worried they would all die while we were on holiday. 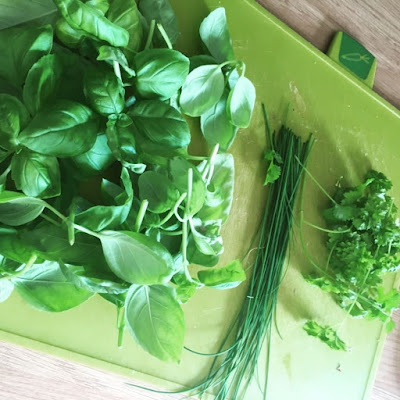 So before we went away I decided to at least use them if there was going to be a chance I'd be coming home to dead mulch, and it was really exciting to use my own basil, dill, coriander and mint! And thanks to a little plastic mini greenhouse find in the Aldi middle aisle, they survived my time away! Gig tickets these days are so expensive that Phil and I have a game called "who would you pay £60 to go and see? ", and honestly, the list is pretty short. 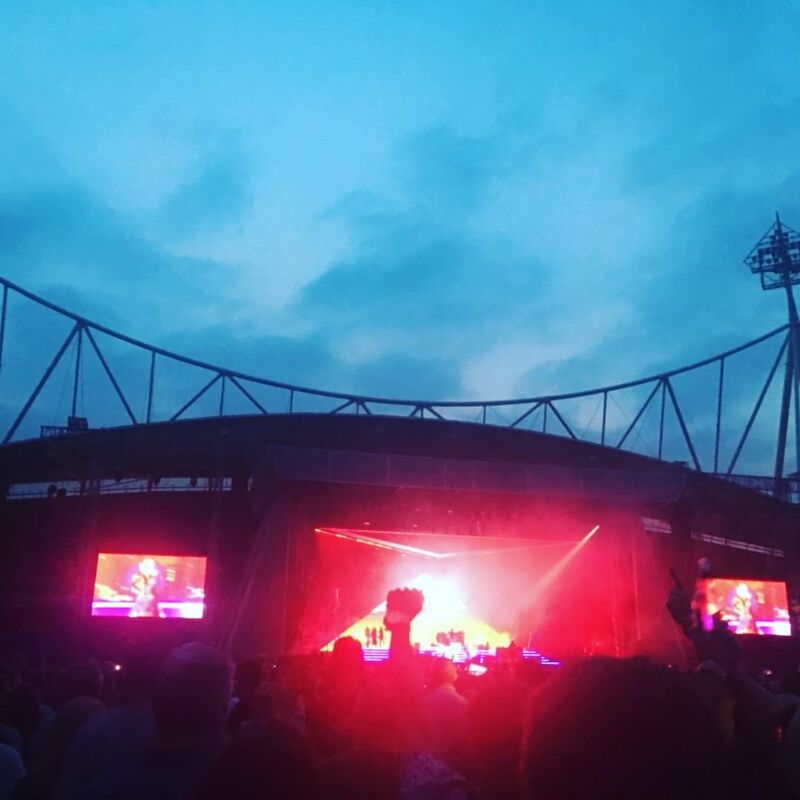 But when tickets went on sale for The Killers, even though they were £65 (we honestly did dither over the extra £5!) we had to go for it. I last saw The Killers at Leeds festival in 2008 so I knew it was going to be a good show. We didn't get off to a good start - it took us 3 hours to get the 22 miles to Bolton, and we thought we were going to miss the gig! We ended up arriving only 5 minutes before they came on stage! They were absolutely incredible - one of the best gigs I've been to in ages! This month I also headed off to Spain with Phil and my parents for 8 days. I absolutely love getting away, turning off my phone for a week, completely disconnected from the world and focusing on reading, eating and nice walks by the sea. I also had a busy trip to London this month. I was down for work doing some courses in the week and Phil was heading down for at weekend for his friend's Birthday so we made a nice little weekend of it. We did some tourism at Burgess pakrun - eventually! Turned out after waiting 20 minutes for a bus that all the buses were cancelled, ran to another bus stop and waited 10 minutes for the bus, got on board and found out we couldn't both board with one contactless card and ended up having to run the 1.5 miles to the park! 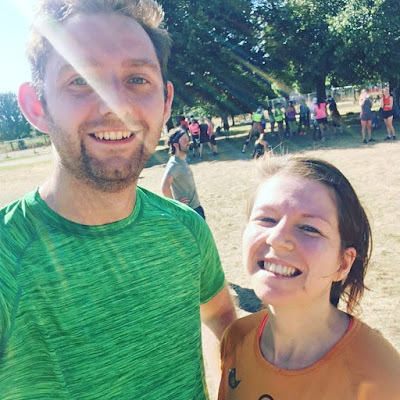 We arrived 5 minutes late, and exhausted, so we didn't get our best parkrun times, but it was an absolutely beautiful park so I'm glad we made it! We spent the afternoon exploring Walthamstow Wetlands which was gorgeous, went to a gin bar in an industrial park and had a great time catching up with Phil's friends from uni. Whatever the opposite of an impulse buyer is, that's me. This month I finally bought a top and a jumper I've been wanting to buy for probably 4 months. It's not quite the weather yet, but I am so excited to wear my new llama jumper and stripey top. And along the theme of quirky prints and stripes, I also got this stripey (check!) banana print (check!) top for €2.50 from Primark in Spain. 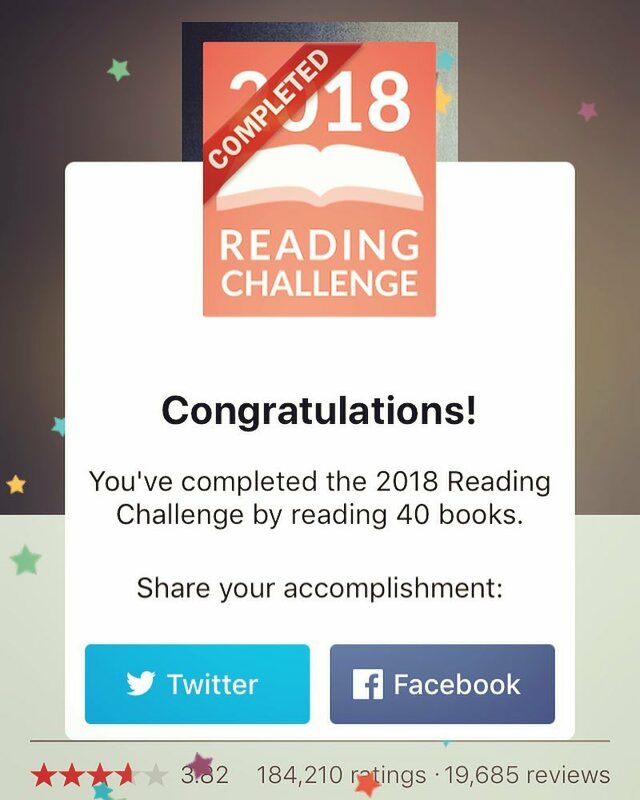 So as I mentioned earlier, I hit my Goodreads challenge of 40 books read this year, and I actually hit it before I went on holiday and read 7 books. My favourites were The Stepford Wives, Everything I Never Told You, The Water Cure, Educated and This Must be the Place. I cannot get enough Maggie O' Farrell at the moment and This Must Be the Place left me broken and bereft when it was over! You might remember by obsession with The Roasting Tin last year. It was my favourite recipe book of 2017, maybe even ever. I've lost count of the number of copies I encouraged friends to buy - two of my colleagues have it, my cousin has it, I bought a copy for my Mum - it's my most recommended book ever. So I was obviously ecstatic last year when I found out there was going to be a Green Roasting Tin full of vegetarian and vegan recipes! 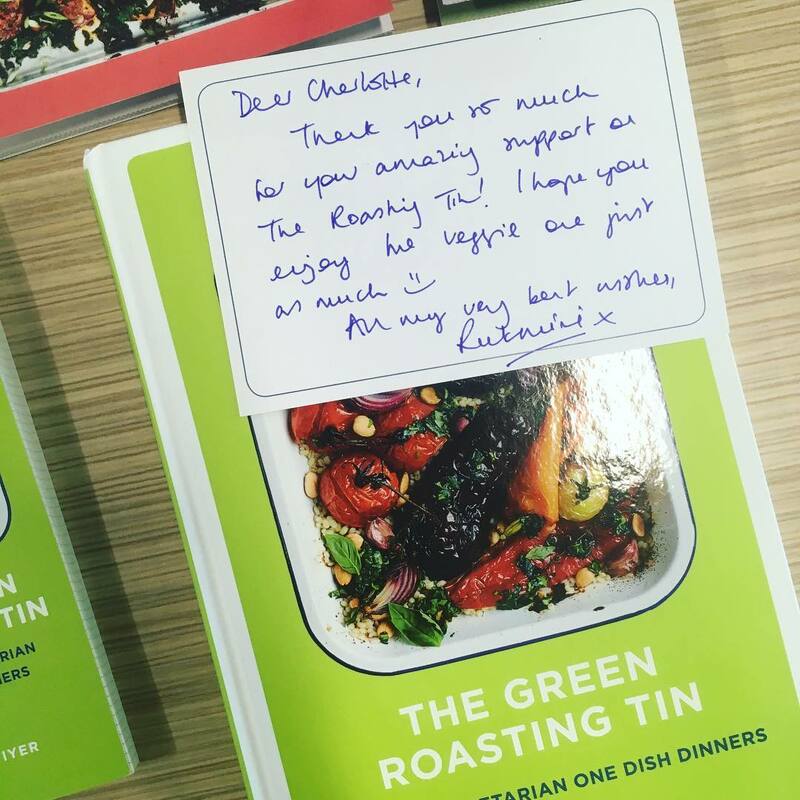 Rumi actually messaged me herself and said she wanted to send me an advanced copy to thank me for all my support for The Roasting Tin which was absolutely lovely and completely unexpected! I have a habit of getting super excited about new podcasts, downloading hundreds, getting my phone full and then deleting them, and about two months ago I was looking for book podcasts to supplement my beloved What Page are you On? and one recommendation I got was Reading Glasses. It sat in my "unlistened" pile for weeks until a few weeks ago when I decided to give it a go, and now I'm obsessed! Unlike What page are you On? it's less about particular books and reviews and recommendations, and more about reading life and book culture. I absolutely love Mallory and Brea and I would recommend this to anyone who loves reading and talking about reading! Well, football didn't come home but I absolutely bloody loved the World Cup. I watched every single game I could and I was absolutely gutted when it was over - good job the Premier League Season starts next week! Phil and I have been putting off watching All About Eve for years - it's been a running joke that we would never watch it. We kept hearing how good it was (Buzzfeed chose it as its number 1 Best Picture winning film a few years ago) but we just didn't fancy it. But this month, on a football-less Saturday night, we finally caved. And guys, it's so so so good. SO good! We totally get it now! It's on Netflix so you should definitely watch it. We're finally catching up (although still totally behind) on The Handmaid's Tale. It's not always the easiest thing to watch (so dark, so depressing) but it's absolutely brilliant. I'm really intrigued by where this season is going! In other "films-we've-been-meaning-to-watch-forever", this month we also watched Before Sunrise which we both completely adored. It's the exact kind of film we both love and I found myself crying at the end but didn't know why?! I can't wait to watch the rest of the trilogy. Hope your July was great and your August is going well so far!